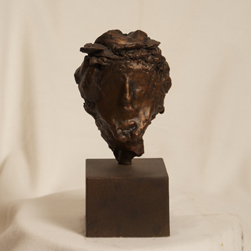 Untitled (Head of Christ) by J. Kirk Richards is a stunning piece of Christian artwork that would make a powerful statement while enhancing any home décor setting. Measuring 10Hx5Wx4.5D, this breathtaking bronze sculpture has its own unique patina and base. This edition is a lettered set, meaning there are 26 sculptures and 5 artist's proofs available.